The design of the great Uffizi palace is the work of Giorgio Vasari, who made it in the sixteenth century for the Grand Duke Cosimo I. The particular shape of the building gives rise to the square, around which the Gallery opens. In 28 niches - opening in the porch - Cosimo wanted sculptures of \"Florentines who have been famous and prominent in arms, letters and civilian governments\". However, Cosimo I never saw the statues he had imagined. Only in the nineteenth century, when the Grand Duchy was ruled by the Lorena family, the printer and publisher Vincenzo Batelli imagined the series of statues representing Tuscans who had distinguished themselves in various fields, from the sciences to the arts. Among the most famous characters, we meet Cosimo the Elder, Lorenzo the Magnificent, the great representatives of the Medici family; the masters Giotto, Donatello, Leonardo da Vinci, Michelangelo; the great poets and writers Dante, Petrarch, Boccaccio, Machiavelli; men of science and adventure, such as Galileo Galilei, Amerigo Vespucci and others. 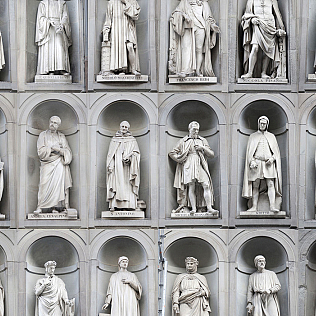 Among the sculptors who created the works, we remember Bartolini, Dupre, Pio Fedi, young talents of the era.